Based in Farnborough and covering the Farnham, Aldershot and Guildford areas, Farnborough Contracting provide specialist drainage contractor works such as drain unblocking, as well as installing driveways and patios, and providing groundworks such as dropped kerbs and concrete bases. If you need a drain unblocking in Farnborough or you’re in Farnham and need a CCTV drain survey, Farnborough Contracting are specialist drainage contractors who will work carefully to meet your needs. If you are looking for a new driveway in Farnborough or a new patio in Farnham, Farnborough Contracting provides a full range of services, offering block-paving, tarmac and shingle driveways with a wide range of designs available. Farnborough Contracting provide a range of groundworks services, including soakaways, tarmac paths and more. So if you need groundworks in Aldershot, Farnborough, Farnham, Guildford or the surrounding area, contact Farnborough Contracting. 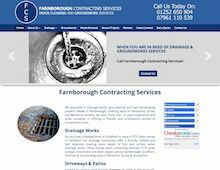 Farnborough Contracting offer free quotes for Drainage services, Groundworks, Driveways and Patios in Farnborough, Farnham, Guildford, Aldershot and all surrounding areas.